Alex de Oliveira will be the Master of Ceremonies for the Brazilian Rio-Style parade at the Brazilian Beat. September 2, 2016 (Boca Raton Florida) – For a second year, SambaLá Samba School will be parading in grand Rio de Janeiro style at this year’s Brazilian Beat Festival to be held on September 10, 2016 from 6 to 11 pm in the Mizner Amphitheater in downtown Boca Raton. The parade which starts around 7 pm will feature over 60 participants including drummers, dancers, and people in beautiful Brazilian costumes. Joining in the parade will be the Master of Ceremonies and former King of Carnaval (or Rei Momo), Alex de Oliveira who was carnaval king for 10 years in Rio de Janeiro. Others participating in this year’s event are “Dyane”, the current SambaLá Drum Queen direct from Los Angeles accompanied by some of her dancers. Also at the event will be Bebel Gilberto on stage with SambaLá Samba School wrapping up the event with a grand samba show in front of the stage. Activities leading up to the parade include a technical parade rehearsal open to the public on Sunday August 28, 2016 from 4-6 pm at Mizner Amphitheater in downtown Boca Raton. On Saturday September 3, 2015 from 9 – 1 am, SambaLá will be crowning their first Drum Corps Queen in Florida (Rainha da Bateria da Florida), Andressa Lamba at American Rock in Deerfield Beach. And on Thursday September 8, SambaLá will be crowning their current Drum Corp Queen Dyane as the California Drum Corp Queen (Rainha da Bateria da California) at SambaLá’s practice space in Powergate Plaza in Pompano Beach (address below). New in September, SambaLá has its own practice space in Pompano Beach at Powergate Plaza near Powerline and McNab. Every Thursday from 8-10:30, everyone is invited to learn to play the samba drums. No experience or instrument is needed. Dance classes will also begin shortly. The address for the practice space is 1419 SW Powerline Road, Pompano Beach, Florida 33069. The official parade kicks off at 7 pm on Saturday, September 10, at the Mizner Amphitheater located at 590 Plaza Real, Boca Raton, FL 33432 and is free to the public. For more information: telephone 310-991-5744, email contact@sambala.org, on the web at www.sambala.org, and facebook.com/SambaSchool. SambaLá Samba School is a not-for-profit organization whose goals are to showcase the best in Brazilian culture through dance, music, and costume. SambaLá is a traditional samba school that works year-round on a carnaval parade which includes an original theme song, the bateria or drum corp, mestre-sala, porta-bandeira, baianas, samba dancers, costumes, sound car, and a float. SambaLá has performed over 700 shows during its 20 plus years including the 2010 Rose Parade with Jack-in-the-box, the launching of the “Rio” car for Kia Motors in Seoul Korea, dancing with the stars, 2014 Coca-Cola Worldcup trophy tour, Bridget Fonda’s wedding, and organizing a world-wide parade in the Rio Sambadrome of samba groups from around the world in the year 2000. SambaLá was founded in 1994 in Long Beach California and in 2015, moved to Southern Florida where it currently resides. SambaLá is a community-based organization that welcomes all who want to dance samba, play drums, or get to know the Brazilian culture. It is made up of members from many countries and backgrounds. For more information, call 310-991-5744. SambaLá is located at 1419 SW Powerline Road, Pompano Beach, Florida 33069. Alex de Oliveira is a carnavalesco (carnaval artist) from Rio de Janeiro Brazil where he designs, costumes, floats, and sculptures. Alex is also an architect and teachers architecture at a university in Rio. 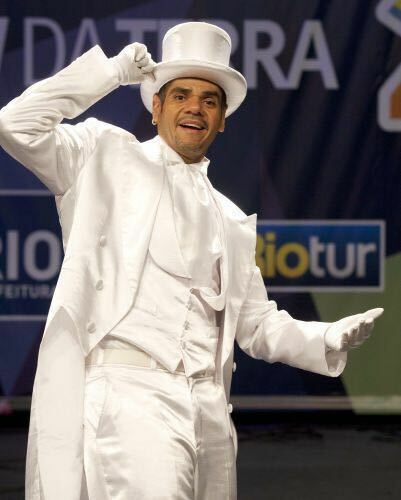 Alex de Oliveira was the King of Carnaval in Rio de Janeiro for a total of 10 years. Alex has paraded previously with SambaLa Samba School in Los Angeles in 2008.